The Italian Football Federation (FIGC) is to open disciplinary proceedings relating to match-fixing at Napoli. The charges refer to the Serie A club's 1-0 defeat against Sampdoria on the final day of the 2009-10 season. The club, along with former goalkeeper Matteo Gianello and ex-coach Silvio Giusti, will now face a FIGC disciplinary committee. 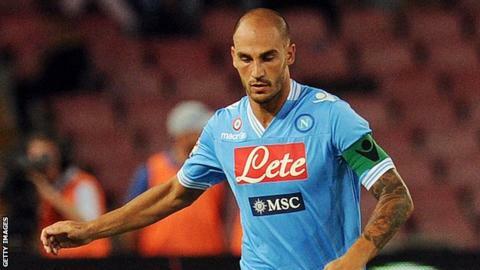 Napoli defenders Paolo Cannavaro and Gianluca Grava have also been charged for failing to report the alleged fix. A statement on the federation's official website read: "The FIGC can confirm that, following an investigation by the public prosecutor of Naples, the federal prosecutor will open disciplinary proceedings in relation to the Sampdoria-Napoli match of 16 May, 2010. "Matteo Gianello, Napoli's former player, and Silvio Giusti, Napoli's former coach, are accused of violating Article 7 (sections 1, 2 and 5) of the sporting code of justice. "Between them, they are accused of attempting to alter the outcome of the match to secure a victory for Sampdoria in exchange for money. "[They are] also accused of having approached colleagues Paolo Cannavaro and Gianluca Grava, from whom they received a refusal." A wide-ranging criminal and sporting probe into illegal betting and match-fixing in Italy has already led to several arrests and bans. Juventus manager Antonio Conte was suspended for 10 months for not reporting match-fixing when he was in charge of Siena, then in Serie B, in the 2010-11 season.